A former Royal Marines commando used his military skills to deal with a huge white pig running amok in a Kent town. 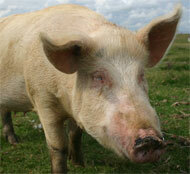 The pig, a Shropshire Prescott, was seen running from pub to pub in the Bath Road area of Margate. Police gave chase, and former commando PC McKellar Watt managed to corner it in an alleyway. But the pig will probably not eat any of the fries, as it is a bulimic pig.